Santa knows when you are sleeping. He knows when you’re awake. He knows if you’ve been bad or good… so why should he only send letters at Christmas time to remind kids to be on their best behavior? Sending postcards from Santa throughout the year is a lot of fun for both kids and parents, and it’s a great way to remind your child that Santa is always watching! You can make your own postcards, search for appropriate designs on sites like Zazzle or go to Santa’s Official North Pole Mail to find cards designed to be sent throughout the years. Here are some ideas for sending Santa postcards. Birthdays: – If you select only one other occasion during the year to send a message from Santa Claus, a birthday is a great time to do it. This is particularly fun for kids who have birthdays in the middle of the year. It’s a great time to tell your kids that Santa is proud of them for behaving so well or to remind them to be on their best behavior if they want to get on Santa’s Nice List for the upcoming holiday season. Spring/Summer Break – Santa Claus works hard during the winter, so he loves to go to the beach during spring break and summer break. This is a time when kids are out of school and may be suffering from the “I’m bored!” syndrome. 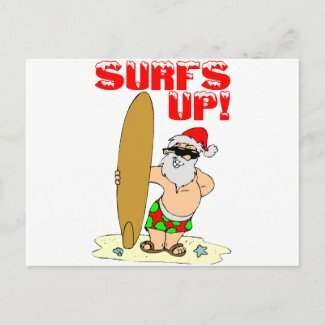 A postcard from Santa during this time is a great way to break up the summer boredom! It’s also a good time to let your kids know how many toys the elves have been making and give them some hints about what the elves are creating just for them. Holidays (Easter, Fourth of July, Halloween, Thanksgiving) – You can have a lot of fun with postcards from Santa on the holidays. Get creative! Did Santa’s elves have to help the Easter Bunny this year because they had a malfunction at the Easter Bunny factory? How are they celebrating Independence Day at the North Pole? Is Rudolph really planning to wear a Darth Vader costume for Halloween? Kids will love to hear how Santa and all the gang at the North Pole are celebrating the holidays. These are just a few ideas to get you started. You can come up with others. For instance, if your daughter scores the winning goal in soccer or your son hits the winning run in baseball, Santa might want to send a note. And how about other accomplishments? You might want to recognize your child for getting on the honor roll, making a new friend, or accomplishing something they’re proud of. Let your imagination run wild! Both you and your kids can have a lot of fun with creative Santa postcards all year long.